After a few days of slackened attention to healthful eating, last night’s dinner was refreshingly light and flavorful. As I’ve previously mentioned, I’m a huge fan of beets. I’m such a huge fan, I’ve been purchasing two bunches each week, slicing, roasting and using to snack on at work. 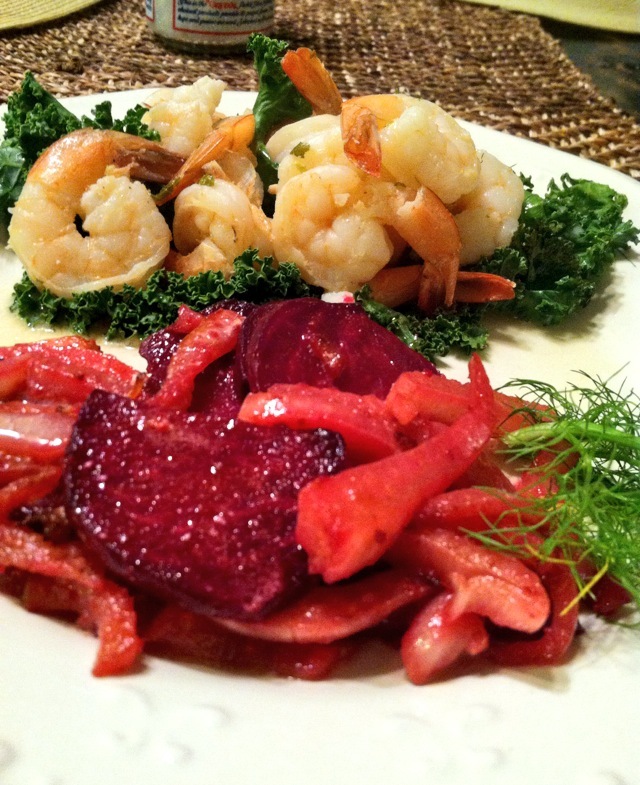 With fresh shrimp sitting in my refrigerator for two days, I had no choice but to make something shrimp-y and I had just so happened to have a hankering beets, fennel and shrimp – all together. Shrimp is one of those things a person has to like for me to be friends with them and even for non-shrimp lovers, it’s hard to resist fresh Lowcountry shrimp. We’re kind of known for it, i.e. shrimp and grits. All too many people prefer their shrimp fried which often ruins the delicate, sweet simplicity of this fruits de mer. I, on the other hand, adore poached shrimp. As opposed to boiling, which is an all too violent approach to shrimp, poaching gently simmers your desired food item in just about any liquid found to be palatable. Typically, I poach shrimp in butter and sauvignon blanc, but wanted something a little different this time. I chose to poach in a coconut milk combination which yielded such subtly vibrant flavor. I have to admit that I’m terrible at measuring ingredients. Mostly, I eyeball anything I can and operate in the kitchen with a monitor-and-adjust attitude. Take this ‘recipe’ with that in mind. Taste it as you make it so you’re finished product is to your liking. 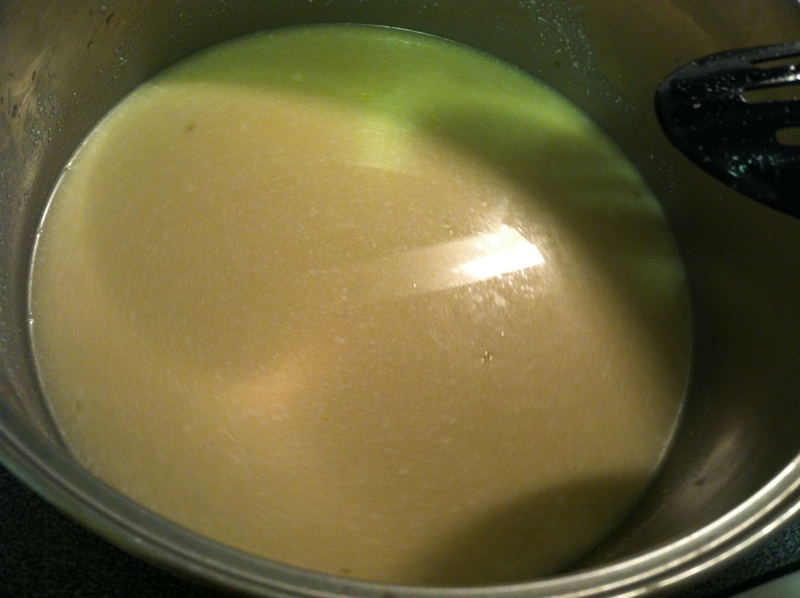 PS – the leftover poaching liquid made a great base for a Tom Kha-ish soup! Combine all ingredients except shrimp in a pot. Stir and thoroughly combine. Slowly bring to a simmer. 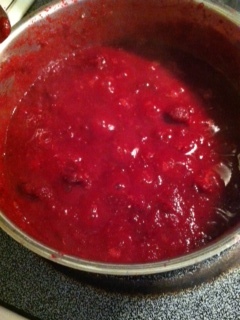 Allow to simmer for 5 minutes, turn off heat and let sit for 10-15 minutes. Bring poaching liquid back to a simmer and add shrimp, leaving peel (you can remove after poaching). Keep a watchful eye over the shrimp and remove from liquid as soon as it is just barely cooked. I warmed a large kale leaf in a pan with a tiny bit of olive oil, served the shrimp atop the leaf and poured a little poaching liquid on top. 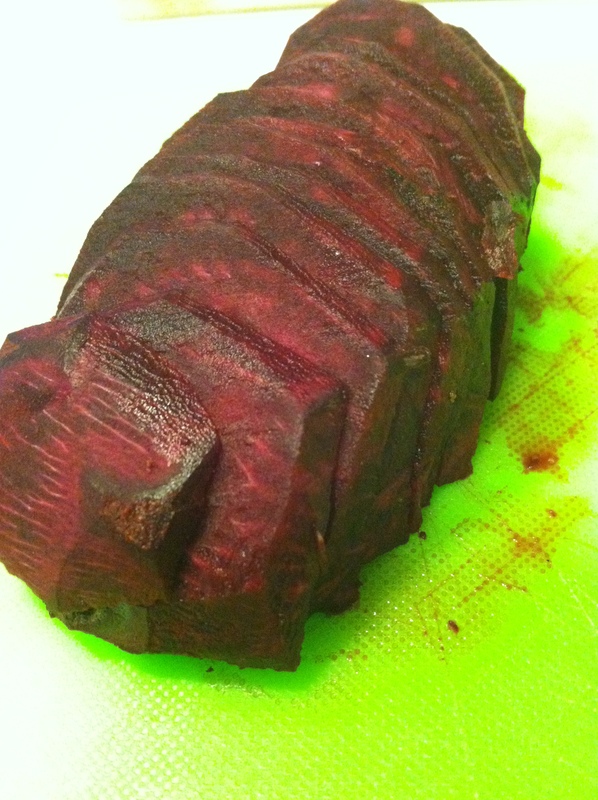 Add sliced beet and cook for a about 3-5 minutes or until just softened. 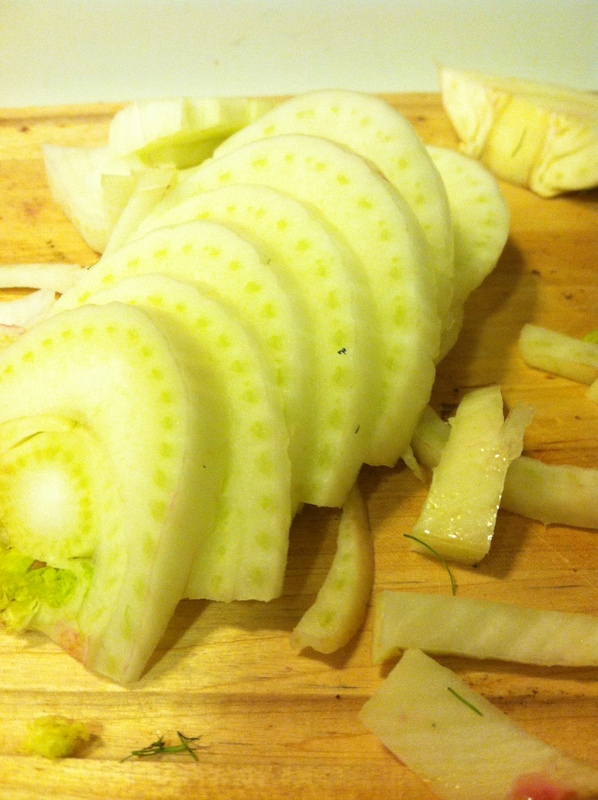 Add minced garlic and sliced fennel and cook until the fennel gains translucence. The beet will make the fennel a lovely shade of magenta. Add a splash of lemon juice, stir to combine and serve alongside the coconut milk poached shrimp. Wanna know a secret? When I made this last night, I accidentally added a much too large splash of lemon juice and it ended a little too tart for my liking. Don’t do what I did. Be conservative with your splash and only add more if you think it needs it. The little bit of a tan in the top corner, that’s a PBR. Yep, Pabst Blue Ribbon. I’m not ashamed to admit that it’s still my everyday beer of choice, Caleb’s too. I stringently restrict red meat consumption in my household to no more than once every two weeks. Caleb and I both have family histories of heart disease; in my case, two grandparents dead by age 40 of sudden massive heart attacks. However, this does not mean I don’t enjoy red meat. There aren’t many things in life as sumptuous as a ribeye cooked to perfection or a melt-in-your-mouth medium-rare prime rib with all the juices surrounding it. As you may know, I do most of my produce shopping at the local farmers market. I also happen to buy meat there when available. Wishbone Heritage Farms of Ridgeville, SC is a favorite of mine; they grow and sell herbs, produce, duck eggs, quail eggs, duck, goose, pork, beef, whatever they have. I recently picked up two huge and ever-so-lovely ribeyes from them as a treat for Caleb. I originally planned to save them for a special occasion, like his birthday or our upcoming anniversary but they were just asking to be eaten last night. Happy Monday steak night? – yes! I had just one small issue – no grill. How is this possible you ask? As recent college grads, a nice little grill just hasn’t happened yet. It’s such a shame during a beautiful South Carolina summer but we do alright without one. So what do you do when you have beautifully marbled, 1 1/2″ ribeyes and no grill? Well, you can just cook them stove-top or you can bake them. OR you can do a little of both. Basically all you have to do is coat the room temperature steak in olive oil, generously salt and pepper them, sear for 30 seconds on each side, then put under the broiler for two-three minutes on each side in a cast iron skillet. Click here for detailed instruction. These steaks were cooked to a perfect medium-rare and had a wonderful crust. I served with fennel-garlic mashed potatoes and brussels sprouts for a man-approved meal. Alas, I failed to take pictures. I’ll leave the details to your imagination. Ladies, if it is that time of the month, I recommend you stop what you’re doing right now and make two, maybe three batches of these. I don’t remember the original basis for this recipe but it’s one I have memorized and can make at the drop of a hat. 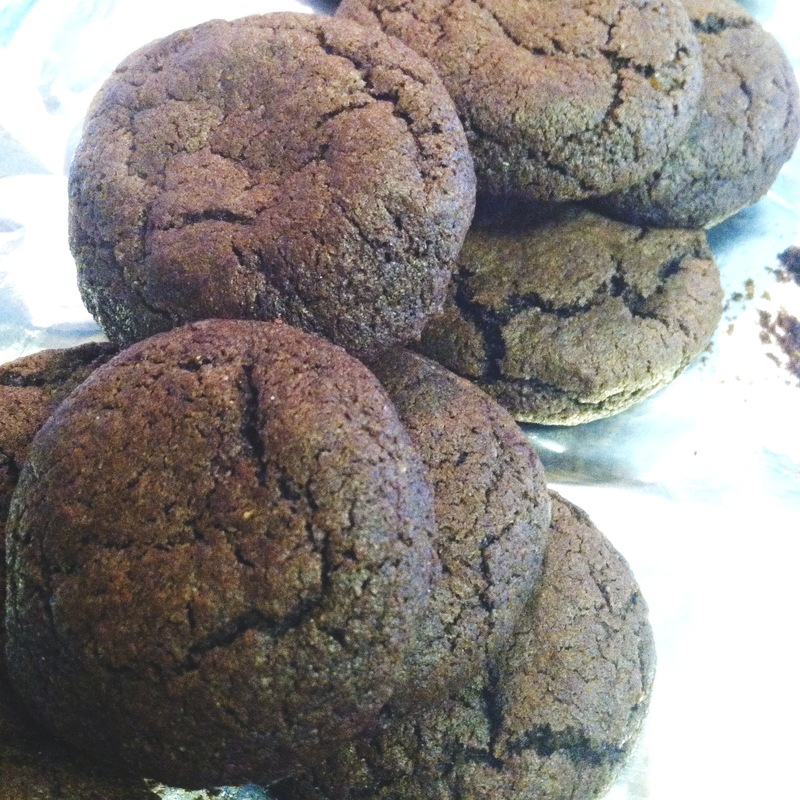 These are not, in fact, very truffle-like once baked but the texture of the dough is quite truffle-y and rich. They satisfy my monthly craving for French truffles and I can’t keep peoples hands from them, especially Caleb’s. Although it may be a cardinal sin as an American, I actually don’t very much care for chocolate chip cookies; instead, I prefer a rich chocolate cookie like this one. Also mint and chocolate are a match made in heaven. In a medium mixing bowl, cream together butter and sugars until fluffy. 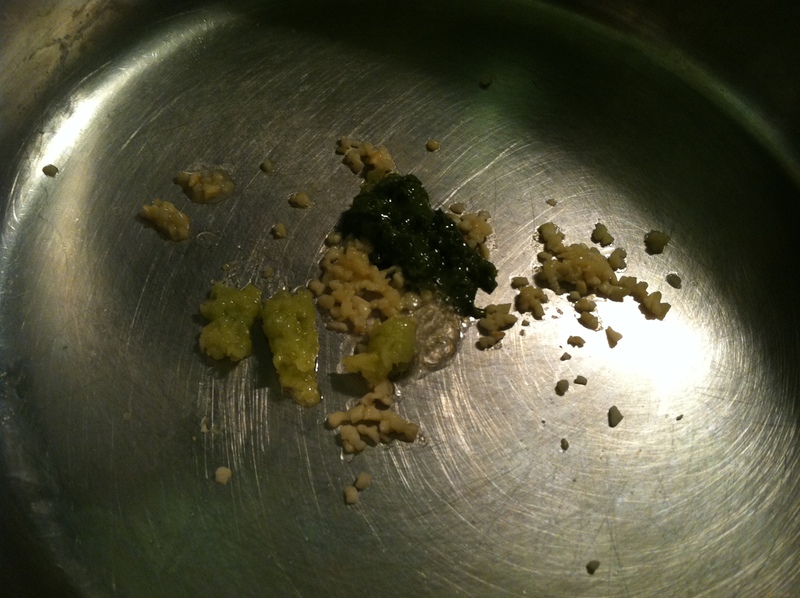 Add in egg, mint and vanilla extracts and mix until well combined. In a small bowl, combine flour, cocoa powder, baking soda and salt. Add flour mixture to wet ingredients and combine thoroughly. Make small rounds with the dough, about 1 tablespoon each. Arrange the balls 2″ apart on baking sheet. Bake for 8 minutes and to prevent sticking, allow to cool for 10 minutes before removing from baking sheet. Aside from the basic butter, milk, eggs that are given kitchen necessities, there are a few things that I keep in my refrigerator and pantry at all times. If these things aren’t there, I’m like a lost puppy trying to get meals together. No matter what I find myself fixing, these things help me to ensure the plates I serve are full of flavor. They might seem like no brainers but its taken me a few years to really figure out what my refrigerator necessities are – aside from the actual poultry, seafood, meat, grains, fruit and vegetables. While not the healthiest thing in my refrigerator, heavy cream has many uses. 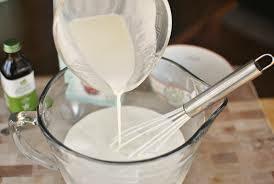 A splash of cream will add depth and richness to any dish or sauce. It’s not that you should drench your food in cream but a little goes a long way. You’ll find that I use a splash of cream in many of my recipes. Not enough to take away from healthful qualities of what is being served but just enough to add that extra little bit of something. Kitchen Basics is my preferred brand. 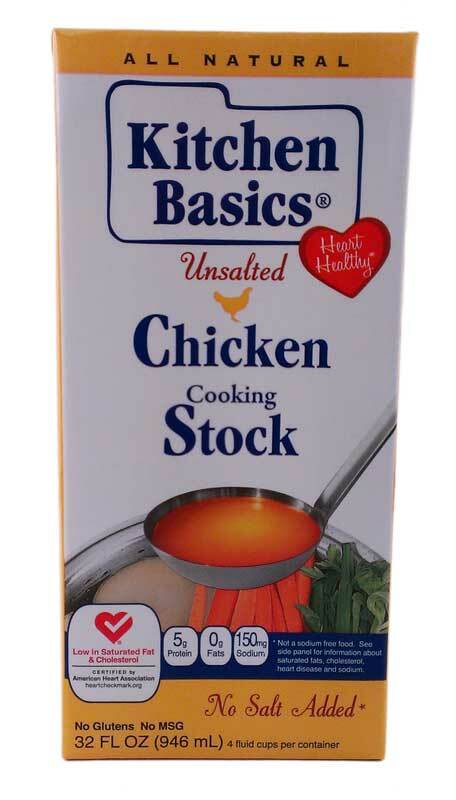 It’s easy to find low-sodium stock but unsalted can be more difficult at times. This one is a keeper. Whether it be chicken, vegetable, mushroom, beef or seafood stock, stock will give you a flavorful basis for any soup or sauce. 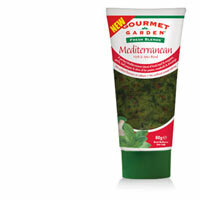 It also gives you a flavorful alternative to water for preparing rice, couscous, pasta, etc. The key is to find sodium-free stock so as not to unnecessarily increase your sodium intake. Oh and don’t use bouillon instead. Just don’t. Nothing beats freshly squeezed juice but a large bottle of lemon juice can help you out in just about any situation. As with heavy cream, I usually just add a splash to what I’m serving. Typically, I’ll add a little bit of lemon juice to vegetables. I use very little salt in my cooking and the bitterness of lemon juice provides great balance, especially when accompanied with fresh herbs. 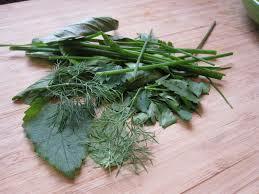 My favorites to keep on hand are mint, basil, cilantro, dill, lavender and lemongrass. An otherwise bland meal is automatically elevated by adding fresh herbs; they add life, flavor and brightness without any unhealthy additives. A dish can be taken from Latin to Italian to Southeast Asian to French to Middle Eastern, all depending on the herbs one uses. If fresh herbs are too difficult to keep up with, I’ve found that Gourmet Garden herb and spice pastes offer a great alternative to 100% fresh herbs and can be a money saver if you find a large quantity of your herbs going to waste. I’m a huge fan of just about any cold soup. Vichyssoise speaks to my soul and any sort of gazpacho is a regular summer craving of mine. With an excess of cucumber in my refrigerator, kindly given to me by Caleb’s mother from their garden, I couldn’t think of a better way utilize the cukes than a summer soup. I’ve been eating a variety of cucumber salads since spring and thought I should change it up. There are so many cool cucumber soup recipes floating around and while they’re all similar, they tend to differ slightly when it comes to flavor and quantity used. After reading over twenty recipes I whipped this up. Like most things I come up with, this is easily altered to suit individual taste; simply add, omit, increase or decrease desired herbs and you’ll have a new concoction. My end result is well balanced and somewhat on the Thai side of the flavor spectrum. 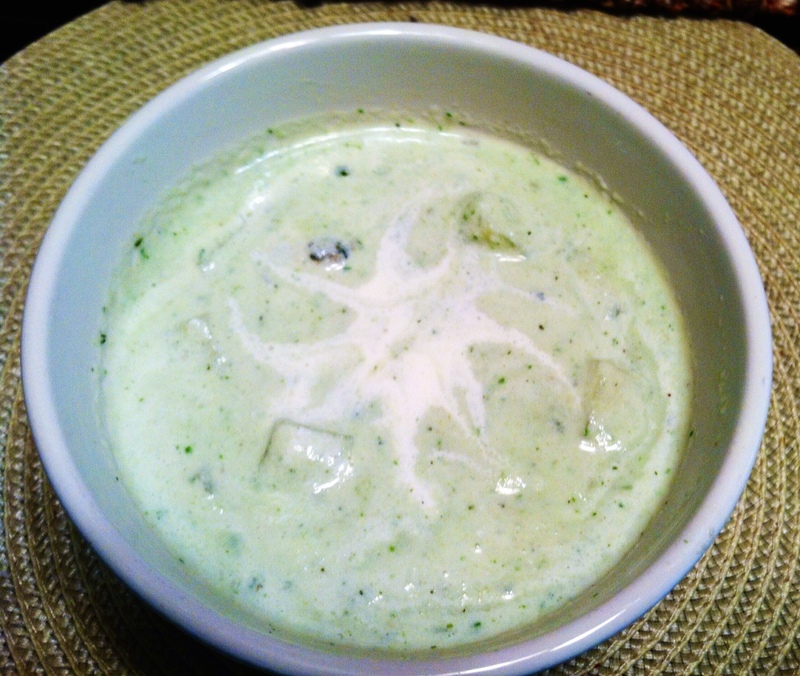 In blender or food processor combine half of cucumbers, half of yogurt and 1 pepper. Pulse on high until well combined. 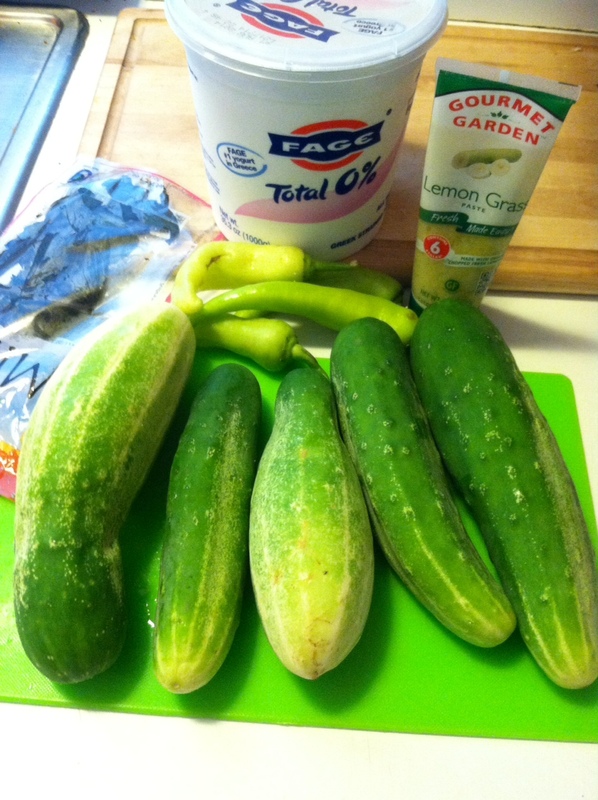 Add remaining cucumbers, yogurt and pepper. Pulse until thoroughly blended. Chill for at least two hours or until cool. I chose to serve with a spoonful of coconut milk and chopped canary melon. Beets really get a bad wrap. I was introduced to them as a child in canned form. The kind you find at buffet salad bars. Not at all a good representation of this vibrant root vegetable. Until a few years ago, I thought beets were gross. Like all foods I dislike, I make it my mission to find a way in which I might enjoy or at least appreciate that which I found distasteful. My beet journey began with beet and lemon filled ravioli and from there to beet and chèvre crostini with honey-orange glaze and beet gnocchi. Beets are truly a lovely vegetable. They can be manipulated in so many ways and offer such beautiful jewel-toned hues to any dish. 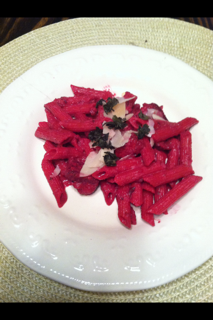 This roasted beet sauce could be altered in many ways to suite individual taste and could be served with any pasta. I think it would go especially well served chunky atop pork tenderloin. Give this sauce a try. It makes for a lovely plate. Cook pasta until al dente. Reserve 1 cup pasta water and set aside. 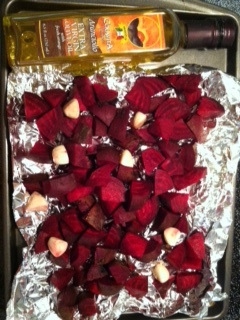 Line baking sheet with aluminum foil and chopped beets and garlic cloves. Drizzle with olive oil. Bake for 40 minutes or until fork-tender. 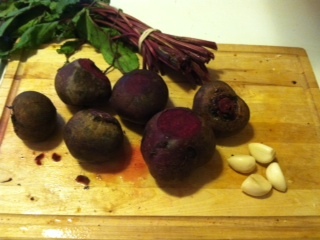 In a blender or food processor, add cooked beets, garlic and Beaujolais. Combine until smooth. In a medium saucepan, add herbes de provence and simmer for about 10 minutes, stirring occasionally. 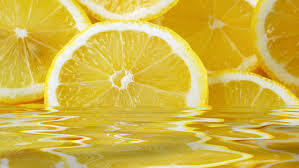 Add a splash of lemon juice, stir. If desired also a splash of cream for richness. Salt to taste. Use reserved pasta water to stretch, if needed. Pour sauce over pasta and stir until thoroughly dispersed. Serve hot, topped with shaved parm and chopped basil. 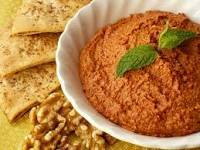 My most recent food obsession is muhammara. I was first introduced to it a couple weeks ago while at lunch after church. In the words of my pastor, “This is what they serve in heaven.” This stuff is outstanding. It’s kind of like hummus but it’s not. It originated in Syria and is popular in Lebanon, Turkey and the surrounding areas. The key ingredients are roasted red peppers, walnuts and pomegranate molasses. You may also see it referred to as pomegranate hummus or pomegranate muhammara. I regret to say that I have not been attempted to make this myself, preferring for the time being, to buy it by the pound from the Middle Eastern restaurant/deli near my church. What makes this so wonderful is it’s subtle sweetness and mellow character. With the large quantity I’ve been purchasing, I’ve quickly run out of pita and while this is great with fresh vegetables, it’s best with a simple flatbread. So while I cannot provide you with a self-tested muhammara recipe (although there are many out there), I will give you a quick, healthy flatbread recipe that could be used for a number of dishes whether you’re preparing a Greek, Middle Eastern or Indian meal, enjoy snacking on flatbread or use it to sop up soup or sauce. Stir in yogurt with spoon until well combined. Using hands, form into a near-ball shape. Lightly knead dough on floured surface for about one minute. Then divide into six balls. Let sit for about ten minutes. 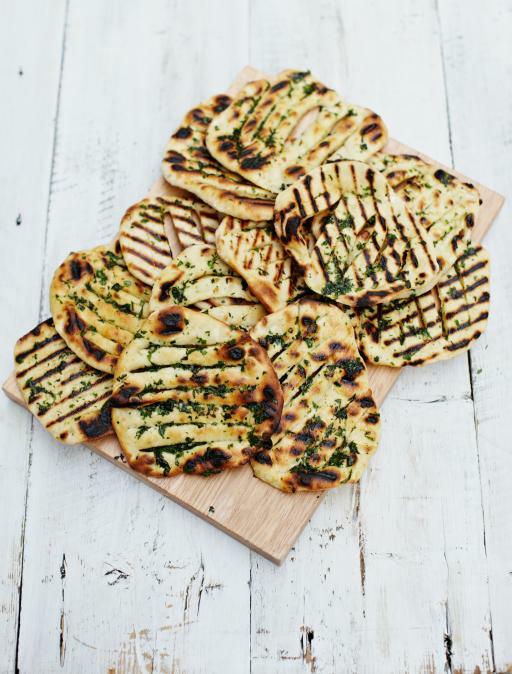 Flatten and create rounds about the size of a small pita. Heat olive oil in a small pan over medium-high heat. 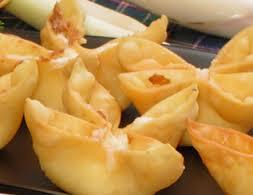 Cook rounds one by one, for about 1-2 minutes on each side or until browned and slightly puffed. My iPhone takes is old and takes crappy pictures. But you get the idea. This one puffed up nicely so it’s too bad I left it on the heat too long. It’s okay, my grandma would just tell me it’s high brown. The past two weeks have been a whirlwind. I can’t seem to separate my days and though I’ve been cooked every night except for a few, I feel as though I’ve hit a roadblock. Although I am only cooking for two people, you’d think I was cooking for a family of six – that’s just how I was taught to cook. Therefore, we have lots of leftovers in my house, meaning that at least two nights a week, dinner is just a smorgasbord of my creations. I grew up loving leftovers; food can taste so much better the next day. If I’m not in a mood to cook, which is rare, I’ll either finish off yesterday’s remainders or I’ll throw together a plate of fruit and raw veggies with a nice little side of cheese, usually brie or Camembert. However, sometimes you’ve just got to have those terrible for you, but oh so good things that you try keep out of your pantry. As I self-describe foodie, I’m embarrassed to say these low-grade, sodium-packed ‘foods’ are things I crave. I have a number of guilty pleasure foods, some from fast-food and some not. I suppose they speak to my upbringing in some way and why I like them is hard to explain but here are a few of the nasty things I like to sneak a bite of on occasion. Okay. Yes. 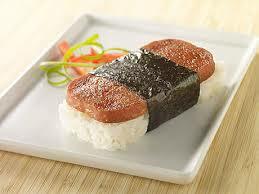 This is a picture of Spam musubi. Yes, I would indeed eat this. Much like Koreans, Japanese, Hawaiians, Filipinos and any Southerner with a background stamped with struggling to get by, I happen to LOVE Spam. Spam, Armor Treat, doesn’t matter. This weird canned meat can be so versatile. You do just about anything under the sun with it. It makes great sandwiches, kind of like a fried bologna sandwich. It goes works fabulously in a stir fry and goes great with eggs for breakfast. I like Spam. Sue me. This is probably the thing I’m most ashamed to enjoy. I’ll get it may two or three times in a year, usually during a certain time of the month, which is when I tend to crave the bad stuff. Being from South Carolina’s Lowcountry, home of some of the most amazing fresh seafood in the country, it’s a wonder I’ll even put this thing in my mouth. The fish is questionable, it has the most insipid excuse for tartar sauce you could think of and a salty American single finishes it off. 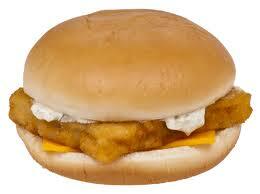 Nothing about the Filet O’ Fish is actually good. Despite all this nastiness, something about it tastes so bad it’s good. I even have a particular way I order it: typically, there is only half a slice of cheese so I order a Filet O’ Fish with extra, extra, extra cheese and light tartar sauce. Actually, I’m not one bit ashamed to like thin mints. And to be quite honest, I am completely obsessed with them. When Girl Scout cookie season rolls around, I turn into a thin-mint-seeking monster. I buy as many boxes as possible and I then hoard them. 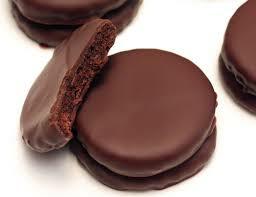 I never binge on any of my guilty pleasure foods and thin mints are no exception. My favorite way to enjoy these delights is dipping them in nice glass of ice cold water. Water, never milk. Milk gives me tummy aches and makes me gag. But the minty-ness with the water is oh so refreshing. Call me strange for it, most folks do. I’m so obsessed with thin mints I once skipped a three hour long class in college just to try and make a homemade version because my craving was so strong. They were good and it was worth it. Don’t lie. I know you have your favorite greasy thing to get from Chinese take-out place nearest your residence. Crab rangoons happen to be mine. Apparently if you pair questionable, crappy seafood with cheese and/or anything creamy, I’m hooked. They’re crunchy and creamy and have so much of that unami goodness. Give me three of these and I’ll be good for months. In honor of le quatorze juillet (aka Bastille Day), I decided to make a French-inspired meal. It began with the weekly trip to the market – the Charleston Spice Company makes a divine lavender flower sugar and a friend of my mother’s was selling blueberries. I immediately knew I had to combine the two items and what would be better than lavender flower sugar macerated blueberries? 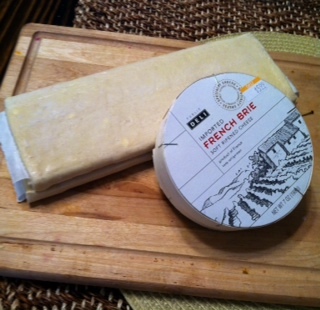 Brie en croûte seemed like the perfect pairing for my concoction. 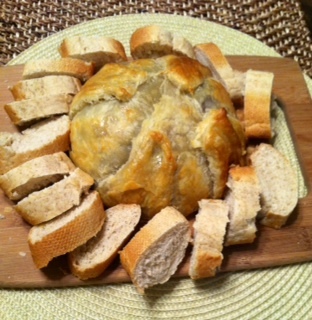 Brie en croûte is simply a wheel of brie baked inside puff pastry. Nothing is more delectable than gooey cheese and flaky pastry. I chose to use Beaujolais in the macerating process but other wines could work just as well. Beaujolais happens to be one my favorite wines; it’s a very young red wine so it’s light in flavor, making it highly versatile. If you prefer whites, you’ll like a Beaujolais. If you steer away from white wine, choose a Beaujolais when others would choose to pair food with white. 1 8 oz wheel brieHeat oven to 375 degrees F.
1. 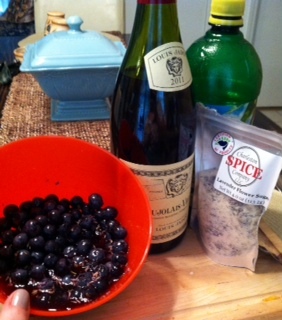 While puff pastry thaws, combine blueberries, lavender flower sugar, wine and lemon juice. Allow to macerate for 40 minutes. 2. Lightly beat egg and stir in 1 T water. Set aside. 5. 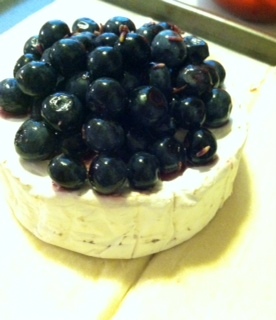 Top brie with macerated blueberries and a small amount of wine/sugar mixture. 6. 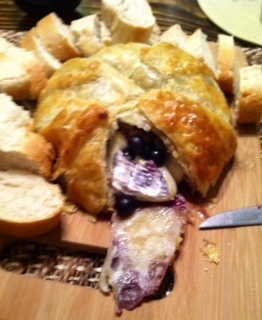 Bundle the brie with pastry by bringing all corners to top center. 7. Purse the pastry so it is secured and closed completely. 8. Coat exterior with egg wash.
10. Serve while hot with sliced baguette. Oh the possibilities when cooking with zucchini… The almost continual supply of zucchini in my refrigerator has meant it is served multiple times a week. I can throw it in anything to add substance and it has such a wonderful meatiness that makes it superbly versatile. Last week’s zucchini star in my kitchen was zucchini lasagna. 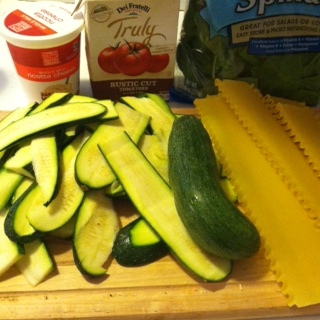 It seems that everyone and their mother has a zucchini lasagna recipe so here is my version. 1. Prep all above-listed ingredients. In a small mixing bowl, combine ricotta with egg. Set aside. 2. Spread a thin layer of sauce on bottom of a 9×13 glass baking dish. 3. On top of the sauce, arrange 3-4 lasagna. The number used will depend on the size of the pasta you are using. 4. Next, add an even layer of spinach. 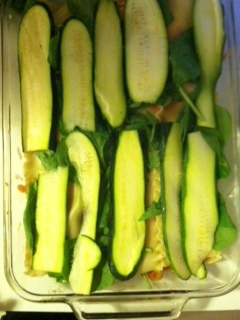 Then, arrange the sliced zucchini on top of the spinach. Follow with a layer of shrimp. 5. 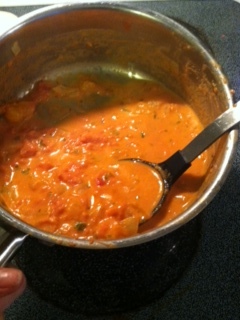 Spread ricotta mixture on top of shrimp and then top with tomato sauce. 7. The final layer should be topped with sliced fresh mozzarella and Parmesan. 8. Bake for 25 minutes or until cheese begins to brown. 9. Allow to cool for about 15 minutes. 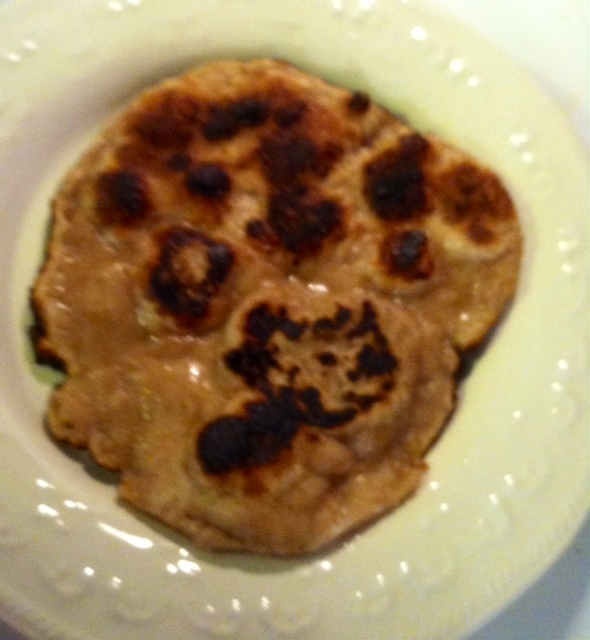 And of course, I forgot to take a picture of the final product. Shame on me. It did look quite pretty though. The bonus to this dish is that it fed Caleb and I for about 3 days and it tastes even better the next day.